Thanks to high-quality materials and workmanship, the minimalist yet tasteful Bega 77011 recessed floor light LED meets the highest requirements in terms of robustness. It consists of a cover ring made of stainless steel, a housing made of glass fibre reinforced polyamide, flush-mounted safety glass on top and a reflector manufactured from anodised ultra-pure aluminium. The combination of these parts grants the 77011 in-ground luminaire by Bega a high level of protection, for instance, against corrosion. Bega, based in the German city of Menden (North Rhine-Westphalia), is a manufacturer of lights and lamps primarily intended for outdoor use. The exterior lights are specifically treated and coated in order to ensure optimal corrosion protection. The traditional company has been operating successfully in the light market for more than 50 years now. The light manufacturer has received many coveted awards over the years. The design of this light is shaped by modest purism. An energy-efficient LED module ensures a high luminous efficacy. 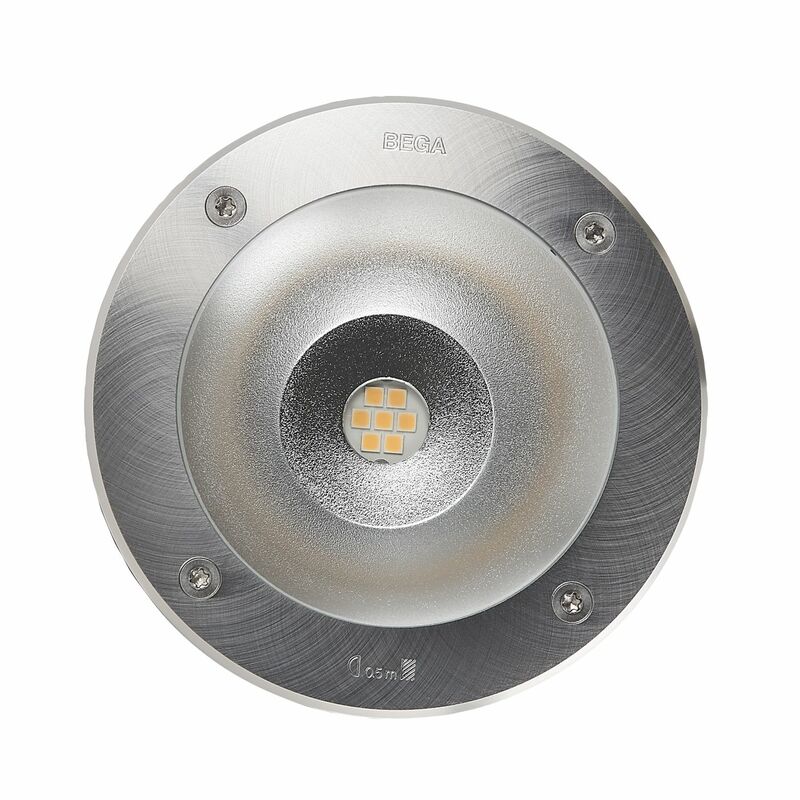 The upwards-directed symmetrical light of the Bega 77011 recessed floor light LED is ideally suited for an accentuating as well as an energy-efficient lighting. Thanks to modern LEDs, the in-ground light by Bega requires only little energy to produce a remarkable luminous flux that exceeds that of a conventional 60 watts incandescent lamp. Furthermore, the floor light is designed according to protection type IP67 which means that it is dust-proof and optimally protected against any weather conditions – even temporary submersion into water cannot harm it. Tell other customers and us about your experiences with the 77011 - Recessed Floor Light LED ! The ground, the lawn or gravel-covered paths are some of the suitable bases, in which the Bega 77011 LED can be recessed smoothly. 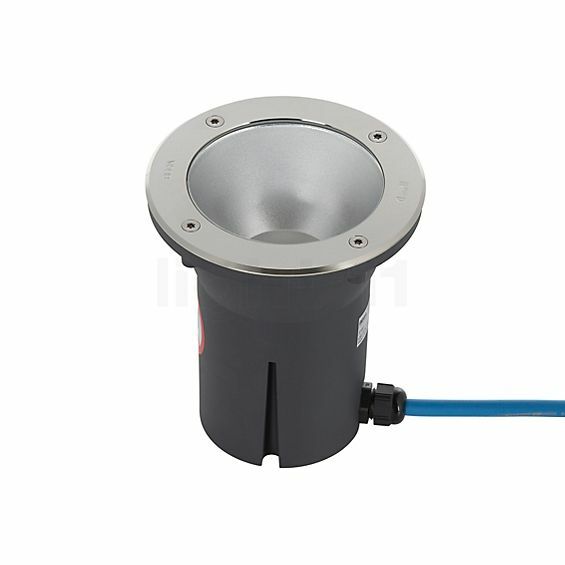 Its areas of application include the lighting of trees, hedges or bushes as well as the illumination of paths, where this floor light provides good orientation, thus increasing safety. Other outdoor applications such as façade illumination, tree illumination, wall light flooding, illumination of signs, lettering, statues or sculptures are further conceivable fields of operation of the Bega 77011 in-ground luminaire that supplies warm-white light with a colour temperature of 3,000 Kelvin. Moreover, the floor light by the German manufacturer Bega visually enhances the outdoor area and creates a representative ambience in the garden.